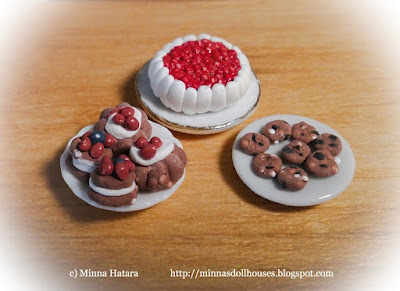 I just love this new silk clay stuff! It feels quite sticky af first, but when you work it in your hands, it becomes dryer and more comfortable to handle. As it is light and soft, it is easy to cut it also when it has dried. 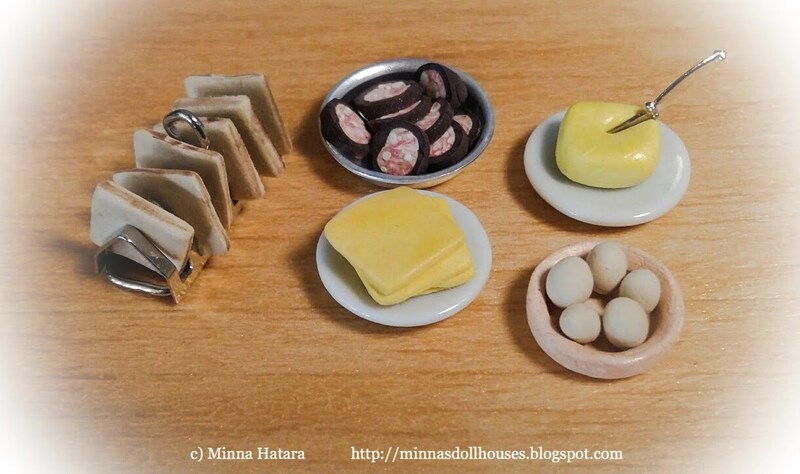 Here are some toasts, slices of sausage and cheese, butter and eggs. And here is a cake, some pastries and chocolate chip and peanut bisquits. I made more bisquits than those eight on the plate. I wonder what has happened to the rest - maybe Elsa the cat has been having some fun with them! Hieno kakku. Kermareunus näyttää niin muhkealta ja pehmeältä. I never heard of silk clay before. Your food looks great. It sounds like a great clay to use. your creations are very beautiful and look realistic. Great work! ¿No te habrás confundido y te las has comido por equivocación? Están tan bien hechas, que no seria de extrañar...y el gato si estaba cerca no ha podido resistirse, es otra opción.